On Saturday, September 24, the President of "Alliance Group" Musa Bazhaev threw a lavish wedding: his younger daughter Elina married Bek Ali Khan Mamakaev - the son of the owner of Dorchester Finance and Alima Cosmetics companies. The wedding was held in the Le Louis XV restaurant in Monte Carlo, where 110 guests congratulated the newlyweds. 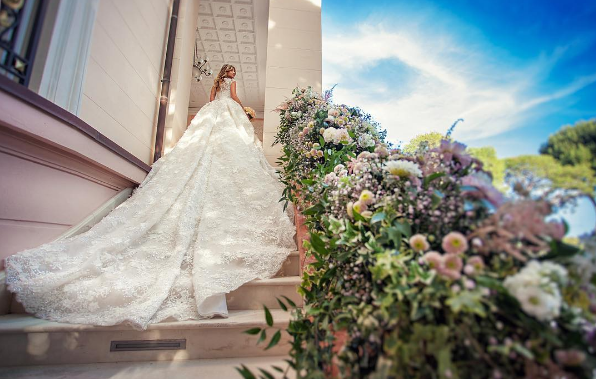 The bride surprised everyone by her beautiful dress: Elina appeared in Zuhair Murad dress for 20 million rubles. Note that eldest daughter of Musa Bazhaev Mariam got married only six months ago. She tied the knot with a young businessman Magomed Erihanov in April. Mariam also chose a Zuhair Murad wedding dress. By the way, the wedding of the eldest daughter was much bigger: her wedding in "Safisa" was attended by 600 guests. 21-year-old student of the Moscow State Institute Elina Bazhaeva and 25-year-old entrepreneur Bek Ali Khan Mamakaev met in February 2016. Having obtained the consent of the girl's father to their relationship, the young man started to date Elina, and two months later made her a marriage proposal. Bek Ali Khan Mamakaev graduated from the prestigious University of London, he speaks six languages. He is the heir of a big businessman - his father Ali Khan Mamakaev owns companies Dorchester Finance and Alima Cosmetics. Elina Bazhaev Elina Bazhaev Bek Ali Khan Mamakaev. It is worth noting that Musa Bazhaev and his wife Louise were absent from the daughter's wedding. According to Chechen tradition, the parents do not attend the wedding of their daughters.